In addition to the world-class diving, you can explore Rinca and Komodo Islands, the only places in the world to see Komodo Dragons in the wild. This is the world’s biggest lizard, they can grow up to 3m long and have even killed humans! This massive beast is not something to mess around with, but great to witness in it’s natural habitat in Komodo National Park. On our trips we’ll visit either Rinca or Komodo, explore the islands and hopefully spot some Komodo dragons in the wild, of course with the protection of an experienced park ranger. On these island visits you can also trek up to a stunning viewpoint overlooking the other islands of the region. 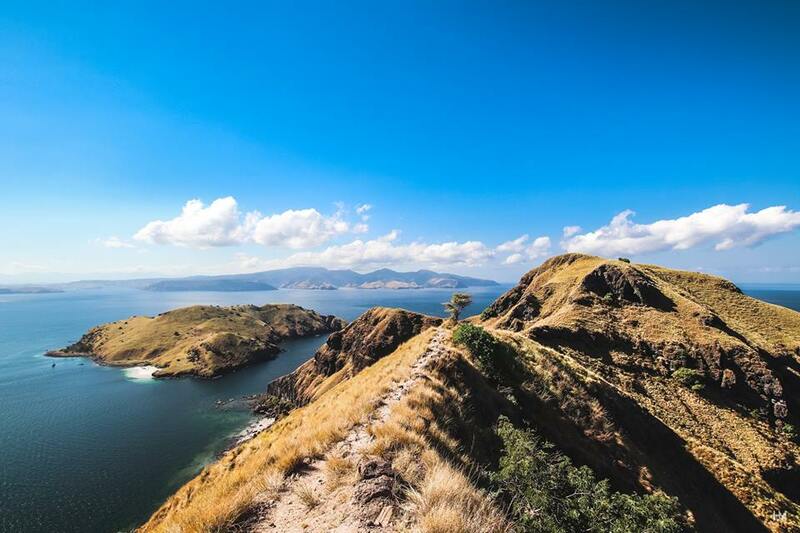 Komodo not only has spectacular diving to offer, the iconic landscape around the national park is simply breath-taking. There are several short treks in the region with unbelievable viewpoints for sunrise and sunset. Padar Island has the most famous view of the region. From the majestic summit, you can spot more than ten different beaches and numerous other islands. It’s easy to reach, just a 20 minute trek up a steep hill and you’re there. In Komodo you can find a very unique phenomenon; a pink beach. Pink Beach gets its colour from red coral broken up into fine pieces, becoming grains of sand and giving it a slightly pink colour. Head to land and enjoy the pristine pink sand, take a quick stroll up the hill on either side of the beach to look back down along the shore or pop around the corner to take a peek at the cove. This viewpoint is similar to Padar as it’s around a 20-minute trek up a steep hill, once at the top you have amazing views down into the bay where we sometimes moor up for the night. This trek is a great way for us to end one of the days of our trip, a beer is optional but tastes amazing while gazing at the beautiful sunset. Every night, a mass migration of thousands of bats fly from the mangrove island, and head towards Flores for a night of hunting. It’s truly an amazing sight to see, a unique experience, watching the sunset sky fill with flying bats. In addition to the world-class diving, you can explore Rinca and Komodo Islands, the only places in the world to see Komodo Dragons in the wild. This is the worlds biggest lizard, they can grow up to 3m long and have even killed humans! This massive beast is not something to mess around with, but great to witness in it’s natural habitat in Komodo National Park. On our trips we’ll visit either Rinca or Komodo, explore the islands and hopefully spot some dragons in the wild, of course with the protection of an experienced park ranger. Komodo not only has world-class diving to offer, the iconic landscape around the national park is simply breath-taking. There are several short treks in the region with unbelievable viewpoints for sunrise and sunset. Every night, a mass-migration of thousands of bats fly from the mangrove island, and head towards Flores for a night of hunting. It’s truly an amazing sight to see, a unique experience, watching the sunset sky fill with flying bats.